The assignment was simple. Drive south of Longview to photograph a group of ranchers protesting oil and gas exploration on some of the last fescue grassland in the foothills. Their beef with big oil? That trucks and backhoes and bulldozers bring invader species – weeds – to this special ecosystem that could destroy the viability of the land that has supported ungulates since the last ice age. It was the most visual press conference I’d ever photographed. 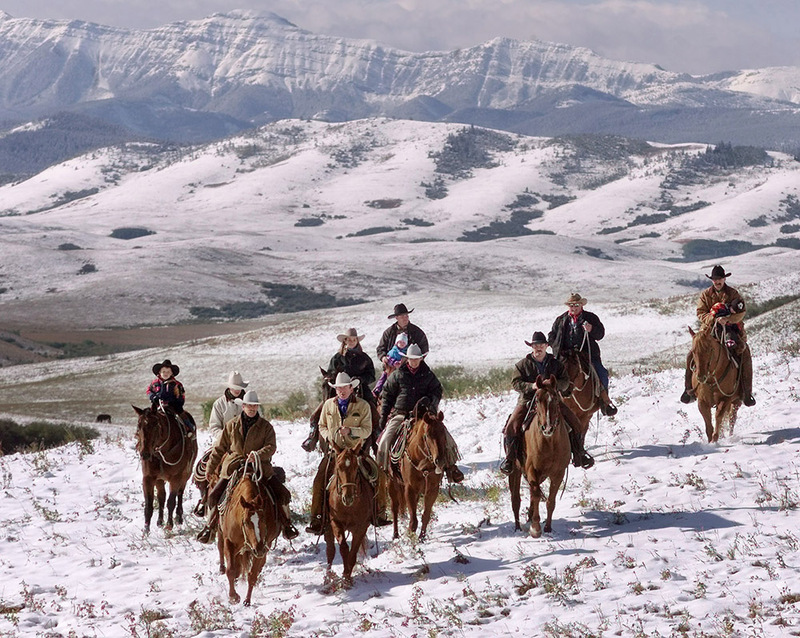 Canadian singer-songwriter Ian Tyson led a group of mounted ranchers on a short ride through snow-covered pasture with the Rockies in the background. The picture was played huge on the front page of the Calgary Herald the next day. The oil company that wanted to explore the area later withdrew its application. That assignment and the iconic “Ian and the Cowboys” picture has changed me like none other. A few days later I came across Tyson’s Cowboyography CD in a Bragg Creek shop. I played it scores of times. It became my go-to drive home music, soothing my jangled nerves on stressful days. One night over supper I described how Ian’s music, created pictures with his words. My wife Lee Ann suggested I photograph those pictures. An idea was hatched. Ian’s song Springtime describes the end of winter in the foothills of Alberta. I started to photograph the scenes he sang about and also contacted him to get his permission and co-operation. He agreed after seeing some of my pictures and I headed out to his ranch to photograph him. We hit it off well and he was pleased when my pictures and the lyrics and pictures were published in the Sunday Herald as a two-page spread. I photographed him a couple more times over the next few years and I came to see the creative drive that still burns within him. He turns 81 this month and is still writing and performing and is passionate about his art and his craft. Through him I came to see the creativity in me. For too many years I thought of myself as a journalist who used artistic techniques to tell stories. Ian helped unlock that creative awareness, and for that I’ll forever be thankful. So why all these words about a picture I made 12 years ago. A Meet the Press fundraiser is scheduled for Sept.16 and Ian has signed a print of the above picture. I’ve had it framed and it will be one of the silent auction items. It is the only copy of that print that Ian has ever signed making it a unique item. If you can’t make it please consider making a donation. What an incredible story (not to mention the photo) GB. You are an amazing person and it’s wonderful how the media family in Calgary has rallied around Tamara. My heart goes out to her and her family.